Our recreation programs are designed to be fun, yet challenging. Basic gymnastics skills are taught on all apparatus providing a strong base of functional movements that enhances balance, coordination, strength, and flexibility. Classes begin with a group warm-up and stretch, followed by structured time on each apparatus depending on the program. Gymnastics teaches the fundamental movement and sports skills that are at the core of every other sport activity. 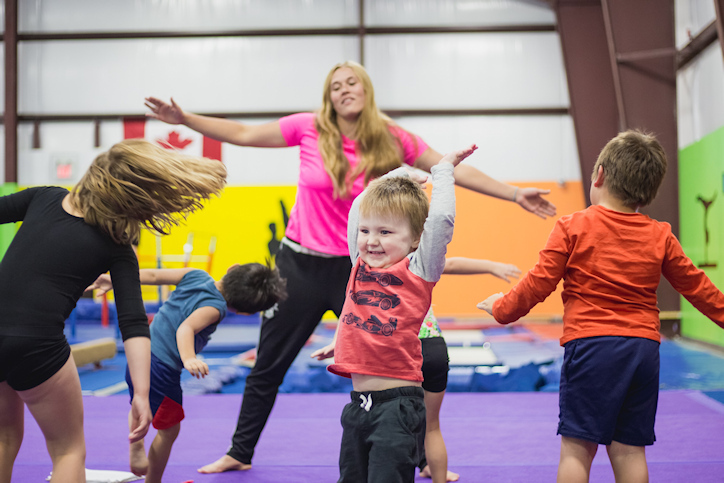 Our KINDER GYM class provides just the right amount of structure to teach children to listen and follow directions while maintaining an environment promoting the fun, fitness and fundamentals of gymnastics. Your child will experience a consistent class routine where they will be introduced to a variety of age-appropriate gymnastics skills. Children will progress at their own pace while being constantly challenged by our qualified coaching staff. As children at this age are ready to participate in classes without their parents they will experience the joy of independence providing the stepping-stone into our Recreational Program. The foundation for future gymnastics learning is laid in this co-ed program. KINDER GYM: 1 hour class for 3 – 5 years old without a caregiver. Children must be able to use the toilet independently. This Developmental Junior Olympic Program consists of the first 3 levels of the 10 level program used in the USA. It was developed with the belief that all athletes, regardless of their potential, must have a solid foundation of basic skills in order to advance safely. In this Developmental group athletes work on foundation skills for higher level gymnastics. They will learn compulsory routines on each apparatus working towards competition. This is a Non-badge program. Participants should complete one session of KINDER GYM or CANGYM Juniors before registering in this program. JUNIOR OLYMPIC 1: 1¼ hour classses, twice per week for ages 4 – 7 years. 28‑week program. Canada's National Skill Development Program that introduces children to the basic acquisition and preparation of introductory skills for recreational gymnastics. There are 12 color-badge levels with 20 progressive skills in each level. Through organized skill based circuits on each apparatus; Floor, Vault, Bars, and Beam, your child has the opportunity to learn and master skills at their own pace. In order to complete a badge, the gymnast must be able to perform each skill required for that level three times consecutively, correctly and consistently. Evaluation takes place constantly throughout the session to keep children challenged but not stressed. BOYS ONLY: 1¼ hour class for ages 6 years + using men's equipment: vault, mushroom/pommel horse, floor, rings, parallel bars and single rail. TEEN GYM: 2 hour class for those in grade 7+ or age 12+. Athletes may choose to continue working on badges or just work to attain personal goals. Check out our new GO NINJA program, a combination of gymnastics, parkour, Ninja and obstacle course training! Exciting new obstacles in the planning! Go Ninja is designed to build strength, flexibility, coordination, confidence and fitness using a variety of Ninja training and parkour style obstacles. The Go Ninja curriculum was developed to combine skill and strength elements conquer obstacles seen on tv and found in gyms, back yards and playgrounds across the country. Go Ninja: 1 hour class for ages 6 and up working on beginning skills in the Go Ninja curiculum. Classes must be paid in full including the AGF fee* and the $200 fundraising bond cheque** before students will be allowed to start classes. Payment can be made the first day of classes. If a payment plan is needed, a signed payment schedule can be set up with the office. Payment can be made by M/C or Visa at the gym, cheque, cash or e-transfer. * All members must pay a yearly membership fee of $50.00 per student for recreational classes. Competitive classes range from $90.00 - $190.00 per student. This "once-per-year" fee partially goes towards each member’s registration to the Alberta Gymnastics Federation (A.G.F.) and to Ponoka Gymnastics and provides each member with insurance. It is valid from July 1st to June 30th of each year. More information and insurance policy details are available by contacting us at Ponoka Gymnastics or by contacting the Alberta Gymnastics Federation. ** Fundraising cheques are cashed the last week of classes IF the fundraising obligations have not been met. Note: All class costs can be found in the Programs and Events page on the class schedules. The listed cost does not include the yearly membership fee.